I've loved seeing what's in other peoples bags. 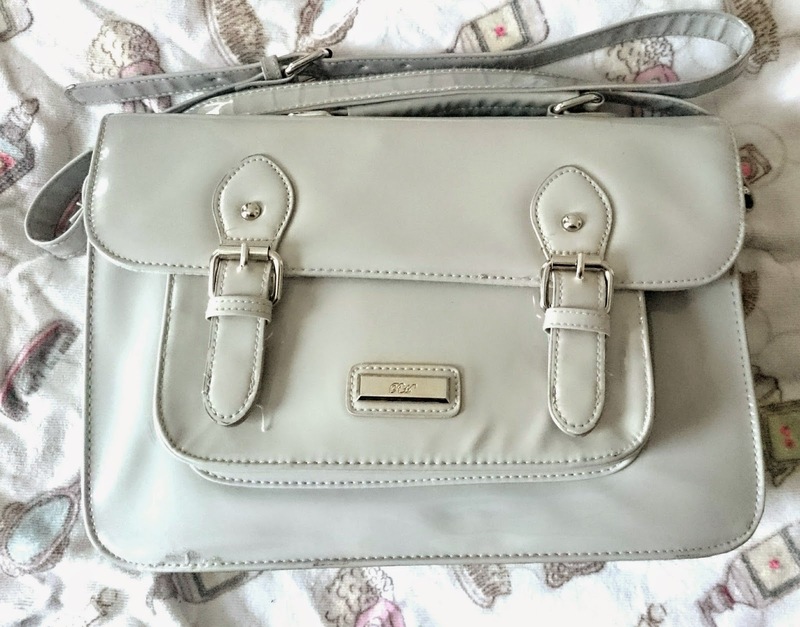 Maybe I'm just nosey but I thought I'd share what I lug about with me in my weekday bag! I have two bags, one I use at weekends and this one I use during the week. It's nothing special just one I don't mind getting a bit battered in everyday general use! It's a red herring satchel I got in the Debenhams blue cross sale for £15. Bargain! Next up is my keys! I had my car keys & my door keys in it. 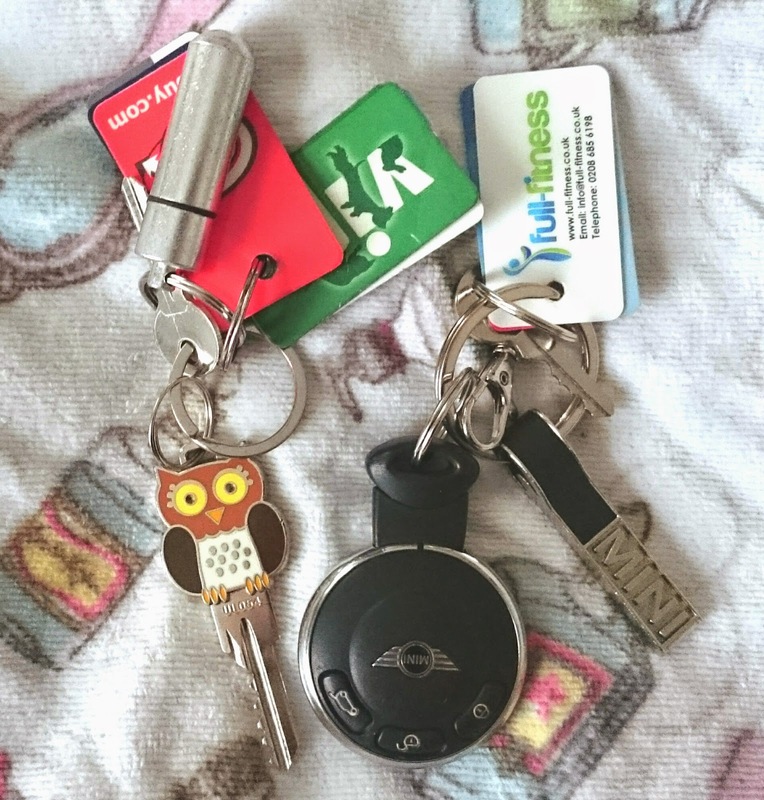 I seem to have accumulated a load of keyring fobs for various different shops! Working with the public has made me always carry hand sanitiser around with me! 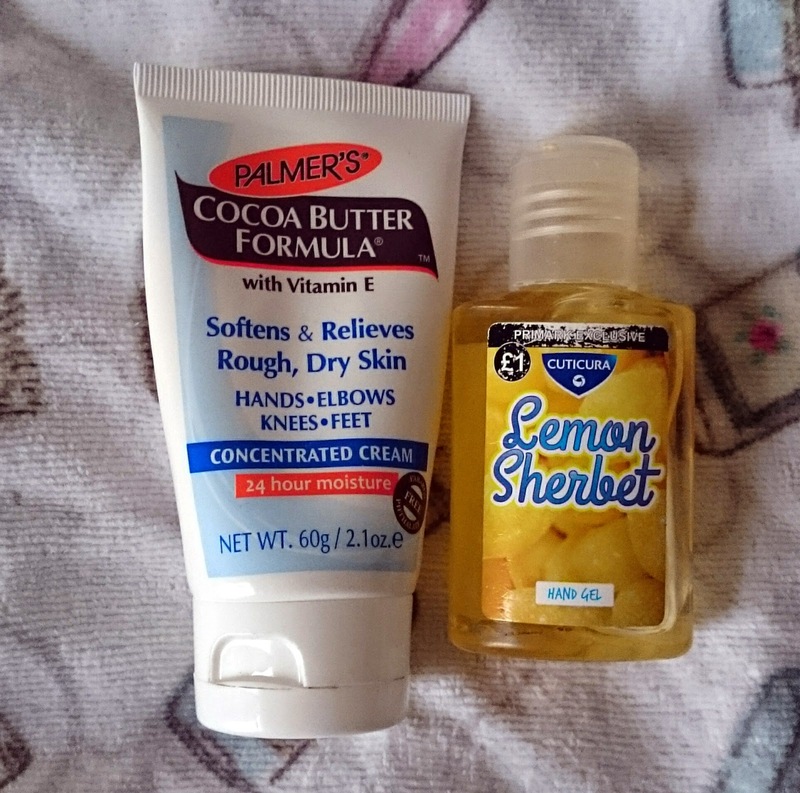 I love this Lemon Sherbert one from Primark, it smells lovely which makes a nice change from the strong alcohol smell some have. I also always carry Cocoa butter moisturiser around with me. I hate having dry hands and hand sanitiser can dry them out pretty quick. I love this one as it smells all chocolatey and yummy! 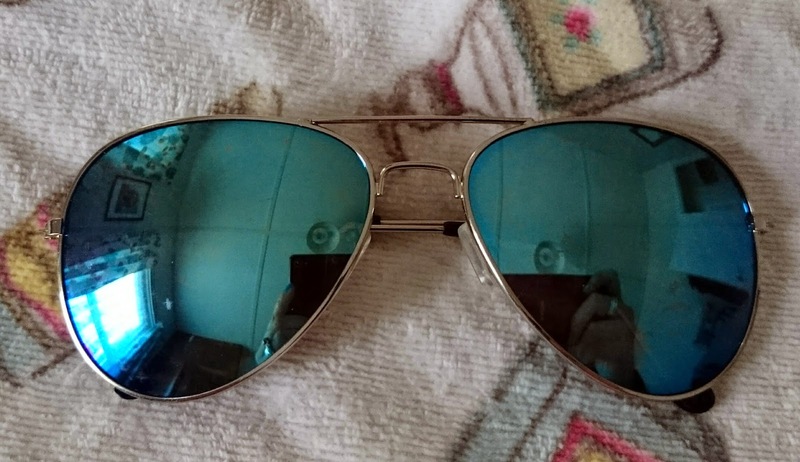 Sun glasses! I usually have my normal glasses and sunglasses in my bag but today I just have my sunnies. I keep a cheap pair in my bag, so I won't get upset if they get scratched or broken. They are super handy to have for driving when it's sunnier than I expected. I always have food on me! 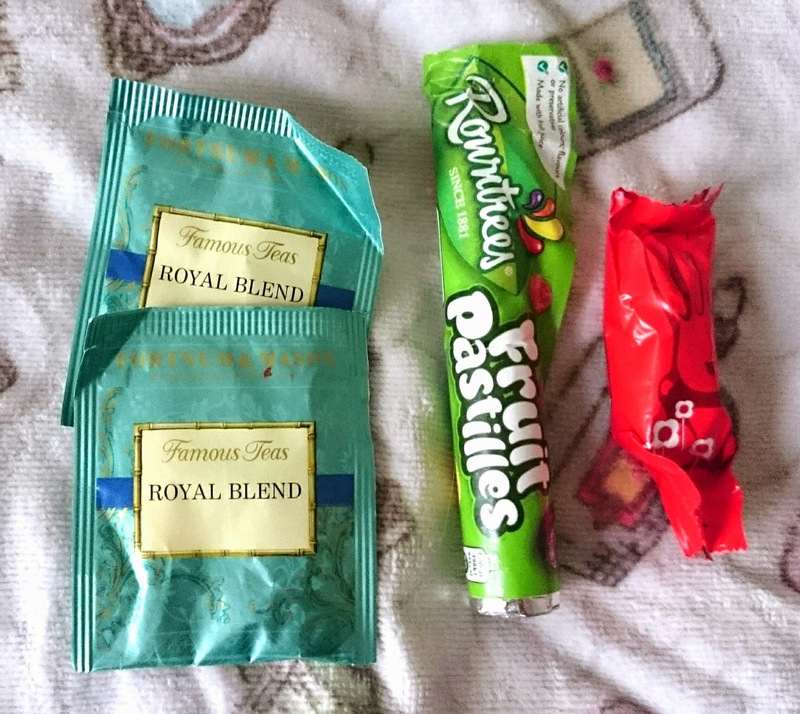 I found a half eaten packet of fruit pastilles, a Malteser bunny and two Fortnum and Mason tea bags. I'm a bit of a tea snob so I do like to carry them with me in case! I was actually horrified by how many lipsticks I had in my bag! I forget I put them in there and they live there for weeks! 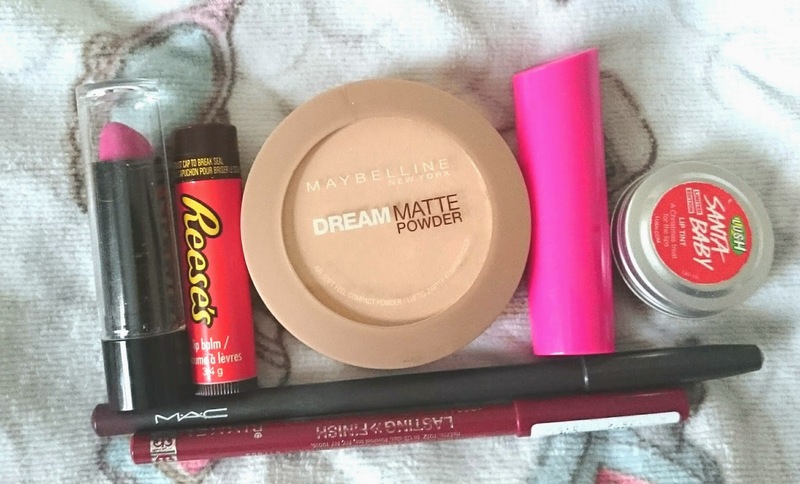 I currently have two cheap ones I picked up in the Asda sale, my Lush Santa Baby, Rimmel Lip Liner (review can be found here - Rimmel Haul), Mac Lip Liner, Reese's lip balm and Maybelline Dream Matte Powder. 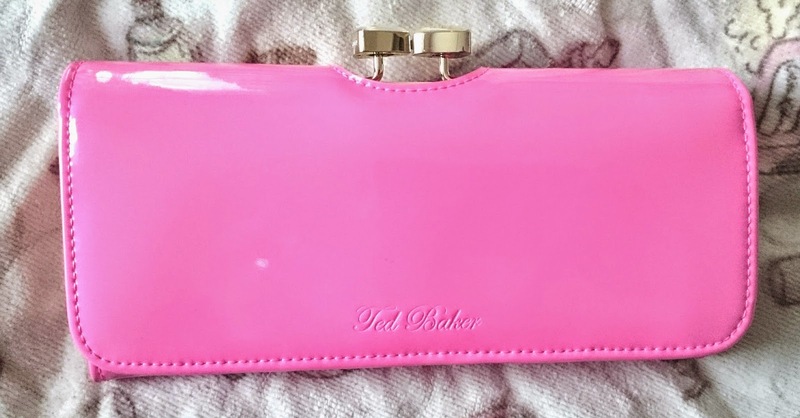 I usually always have a powder in my bag for those shiney moments! Receipt. 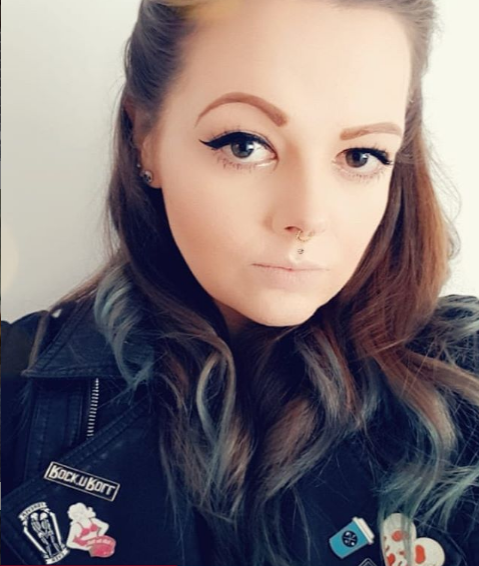 I'm surprised there's only one. I'm actually hopeless at binning them and usually have a bag full of old receipts I don't need. This one is from Card Factory as my mums Birthday is on the 8th, so I popped in there today to get a few bits. Min usually has my purse, keys and a little mirror, tissues, a kids toy, some raisons for the girlies, my phone, and lots of receipts or shopping lists. My bag is jammed full of receipts. I love your purse!! :D it's pink!! Lol.